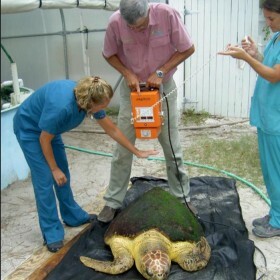 GSML’s sea turtle research and conservation program, began in 1964, is the third oldest in the United States. GSML was an early advocate of providing legal protection when sea turtles were still commercially harvested. 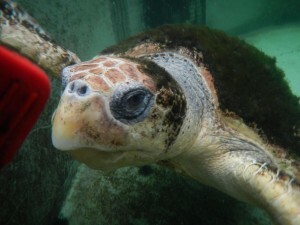 After passage of the federal Endangered Species Act, GSML coordinated with state and federal agencies and became the regional sea turtle rehabilitation center. GSML directors Jack and Anne Rudloe published a cover story in National Geographic Magazine featuring the program. 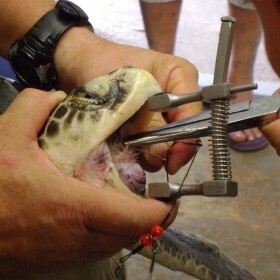 GSML treats and releases 5 to 20 endangered Kemp’s Ridley sea turtles and protected Loggerhead sea turtles per year, most commonly for swallowing fishing hooks. 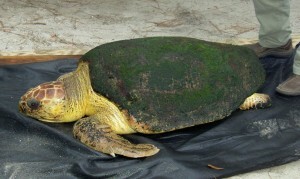 GSML collaborates with Wakulla County to treat turtles taken by recreational fishermen at a county pier. All group tours receive information on sea turtle biology and conservation in the course of their visit. Lil’ Herc was kept at Marineland in St. Augustine for several years before moving to SeaWorld, eventually moving here to GSML in January of 2017. She has been in captivity for close to 20 years. 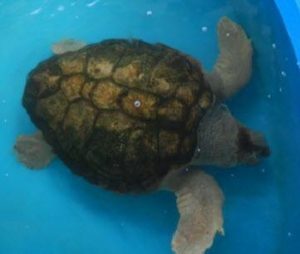 She was struck by a boat, which blinded her, making her a permanent resident turtle utilized in teaching people about sea turtles and the impacts humans have on them. 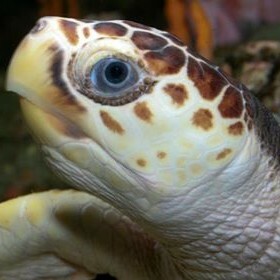 Of the seven species of sea turtles, Kemp’s Ridley is the most endangered. 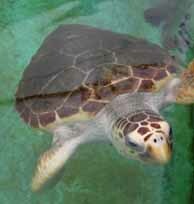 Because of a dazzling spot on the scutes of his shell, we named one of our rehab Kemp’s Spot the Magnificent! 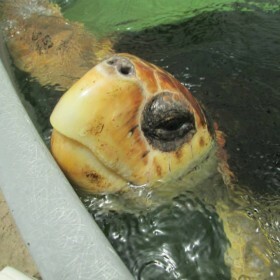 Allie is a loggerhead sea turtle rescued on May 15, 2012. She was found floating, sick and weak near Alligator Point Beach. When she arrived at GSML she was very thin and emaciated. After several visits with our veterinarian and our staff working closely with her she became 100% better. She put on considerable weight, and was able to submerge to hunt for food. 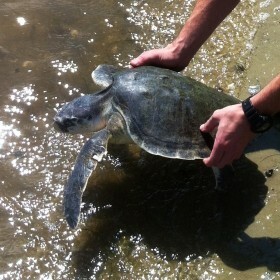 After receiving a clean bill of health from our veterinarian, we released her on June 22, 2013 at Bald Point State Park. She is approximately 50 years old and weighed 250 lbs at the time of her release. 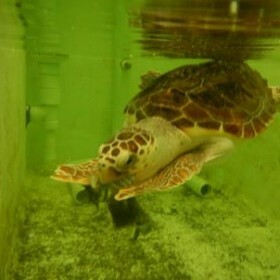 For updates on our sea turtle program at the lab like us on Facebook. Little Girl is a juvenile loggerhead sea turtle who was on display at GSML for several years. 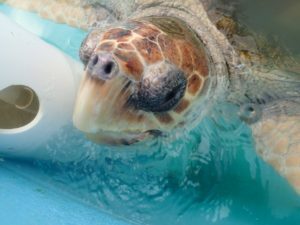 She was approximately 8 years old and weighed about 40 pounds at the time of her release, which was at the end of December, 2016. Little Girl was an ambassador for sea turtles, having helped staff at GSML teach thousands of people of all ages and backgrounds about sea turtles, helping to protect them and their environment.